Home» What’s YOUR Home Worth? Get Personalized Data on Your Home. In less than 30 minutes we will send you a Market Snapshot. This report provides this week’s housing market statistics and trends to help you better gauge market conditions. View the Sample Market Snapshot here. 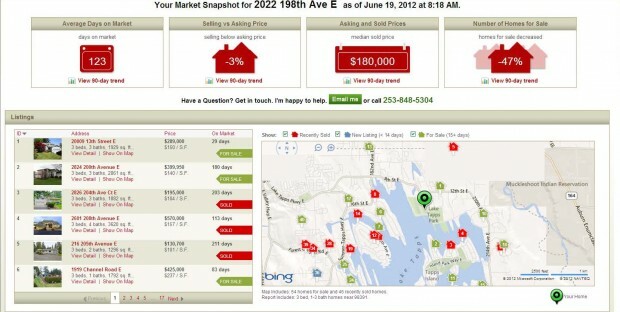 Your report will be personalized: it charts market activity– current up-to-the-minute –with homes in your area, including such data as sold homes, properties for sale, inventory counts and even days on-market. There are many ‘intangibles’ behind this data, such as whether homes were fixed up or not, special amenities and the like. We have the local market expertise to help you interpret this information fully.